I finally got around to uploading the pictures I took from my recent cruise to my computer from the memory card - all 1,151 of them - and now have the rather daunting task of sorting through them to find out which ones to keep and which ones to send to the recycle bin. I get the feeling it may definitely take me awhile! So, while I'm doing that I thought I'd share at least one that I was rather pleased with. 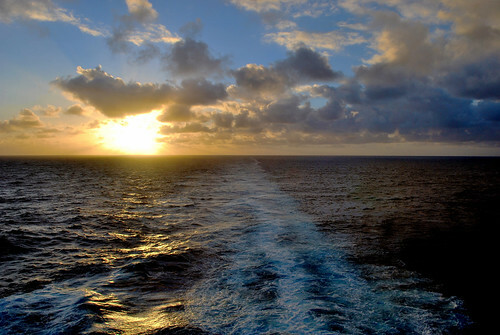 This shot was taken from Deck 10 Aft on Saturday morning as we were making our way back towards Miami. I had gotten up extra early that morning to take pictures of the sunrise but for awhile there I wasn't even sure if there would be one due to the clouds that were gathered on the horizon. Fortunately, the sun did manage to break through and this is one of the shots that I got that morning. Makes the equilibrium issues I've been having since I got home more than worth it I think! This beats a moon shot any day of the week! Simply divine! This is an amazing shot Linda. I'm waiting for a glimpse of all the pictures you took. You take great shots. Sorry that you are having equilibrium issues. We are so used to boating that it doesn't bother us even if we are in rough seas. It did when we first started boating though so I can relate. It will pass. That one is so beautiful, the cruise line should pay royalties to use it. That's absolutely beautiful. Can't wait to see the rest of the pictures from your trip! lovely shot! and i used to get those sea legs thingies going on after a cruise for about a week. it went on for about 4 or 5 cruises and then stopped happening. i have no idea why but it IS annoying i know. One of the things I look forward to when we finally cruise is seeing the sky away from the light pollution of land. I know there will still be running lights and such on a cruise ship, but it seems to me that the stars will still be quite the sight at sea. Next Time The Dreaded 'C' Word is NOT Invited!